None of these options fit what you are looking for? Fill out the form to the right and we will provide you with a custom package price! There is surely no shortage of Michigan golf resorts. 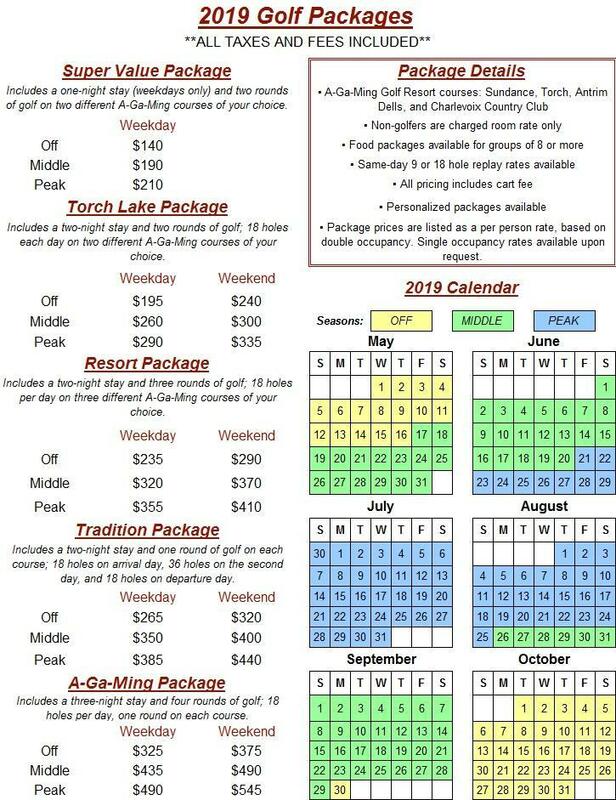 However, we can assure you it would be difficult to find better golf and accommodations in Northern Michigan for what you can get at A-Ga-Ming Golf Resort. Whether it's a couple, eight old friends from high school, 16 guys from the office, or a 40+ person group, A-Ga-Ming Golf Resort is unbeatable! 72 Holes of World-Class Golf! If the quality of golf is important to you, you will be extremely pleased with the Antrim Dells, Charlevoix Country Club, Torch, and Sundance courses. Great golf courses are a combination of superior layout and conditions; both at A-Ga-Ming are impeccable. By offering four 18 hole courses, you are able to experience the variety of features each course has to offer and see each one's character throughout the round. It's All About Attitude! People are on vacation to relax, unwind and have a good time! At A-Ga-Ming, you can come as you are and relax in a way that's most comfortable for you! We have a good time here and you will too! Silky Smooth! What's the most common complaint you typically hear from golfers about a golf course? The greens! At A-Ga-Ming, we will often hear "Those are some of the best greens I've ever putted on!" and they remain one of our best features. Food and Drink Options Aplenty! No matter which of our three locations you are at, we are sure to have you covered with a variety of food and beverage options. All locations have a restaurant or bar & grill, along with snack shops at the halfway points. Beautiful Accommodations Built for Vacations and Celebrations! A-Ga-Ming Golf Resort offers three spectacular onsite accommodation options: Maplewood Ridge, Cedar Hollow, and Vista Townhomes. All have beautiful views, patios, and grills for outside cookouts after a day on the golf course. Most accommodations were built for entertaining with open living spaces.